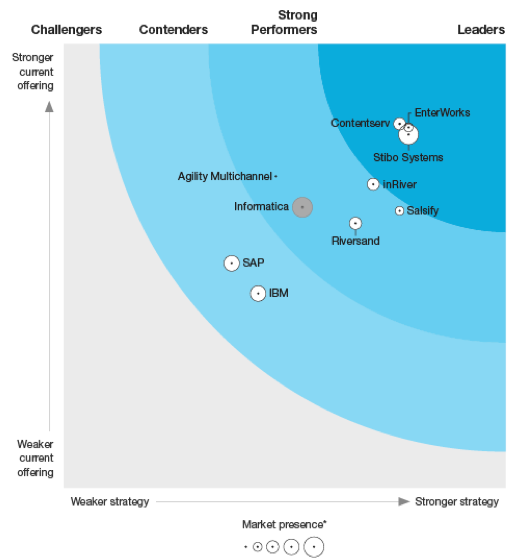 Forrester has evaluated the top Product Information Management (PIM) vendors in the marketplace. Fill out the form to receive a complementary copy of the research. "[Salsify's] true multitenant platform delivers the fastest time-to-value of any PIM solution in this evaluation: Customers have loaded catalog data as soon as week 2 into an implementation and have completed integrating with digital platforms in under 12 weeks," wrote Forrester. "Salsify is a best fit for brands that need a PIM system to manage the rapidly changing content requirements of digital channels." Fill out the form to download your personal copy today. Salsify has always sought to comprehensively address the complex product experience needs of forward-looking brand manufacturers. PIM is only one portion of PXM – the technology that’s required to accelerate digital and digital-influenced sales. In addition to these latest citations by Forrester, the Salsify platform is also recognized as a top digital asset management (DAM) provider on G2Crowd, while also providing brands with an complete, integrated digital shelf analytics package.